Bleach kills germs without damaging the fabric. Use hot water or bleach to kill dust mites and remove other allergens. Fade-resistant color and durable fabric means less need to replace. Vibrant colors and a clean, fresh look for the life of the product. Simple stain removal with no bleach discoloration. Rich colors retain their beauty and depth for the life of the towel. MAGIC TOWEL is a unique product range and dyeing process applied to 100% cotton, poly-cotton and Lycra yarns, or fabrics. It is a cutting edge technology that makes towels and other items impervious to even the harshest chemicals. Towels from MAGIC TOWEL Home can be deep-cleaned in hot water or with chlorine bleach without damaging their color, helping to create a healthy and clean home and work environment. From baby’s bath-side, to kitchen counters and hairsalon workstations, MAGIC TOWEL is transforming an everyday activity into a remarkable experience. Hair treatments using bleaches or peroxide no longer leave unsightly blotches on your towels. You can even remove nail polish with acetone without damaging your towels. Recommended and used by leading dermatologists and clinicians, MediTowel is the only towel that gives users and patients the assurance of sterility while looking so good. Want to keep your kitchen germ free? Bleach your kitchen MAGIC TOWEL removing all germs and bacteria without ruining the color or texture. Even the toughest stains like blood, grass, wine, industrial chemicals are easily washed out without damaging fabric color and performance of your MAGIC TOWEL. 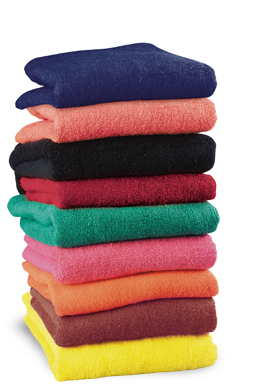 Select from a vibrant range of MAGIC TOWEL fashion colors. You'll be able to bleach out germs, bacteria, or tough stains and they'll still look good afterwards. Goodbye to germs, bacteria, and stains where hygiene is essential. MAGIC TOWEL products will save you money, while looking cleaner and brighter than thosee dingy, old economy fabrics. Where impeccable hygiene, good looks, durable quality and remarkable cost savings are an essential combination, MAGIC TOWEL delivers the solution. That Magic Towel logo shows your patients you practice the highest standards of hygiene and care about their health, while adding to the esthetics of your medical office. Seniors are more vulnerable than most to germs and bacteria. Maintain a sterile environment with fade-resistant, bleach-impervious, durable and sterile MAGIC TOWEL products. Fade resistant, Soft & absorbent, Sterile, 100% fine cotton and Last longer than other towels. Maor Technologies / The MAGIC TOWEL Company All Rights Reserved. No part of this web site may be reproduced, transmitted, or stored in any form or by any means, electronic or mechanical, including photocopying, without the prior written permission of the copyright owner.